Eight life-size photos of pedestrians caught by Google Street View cameras have been fixed on the buildings where they were taken as part of an art installation for Lincoln Frequency festival. The project by Italian artist Paolo Cirio is called Street Ghosts and brings blurry images of pedestrians seen on Google Maps to the real world. His project has seen international exposure, with Street Ghosts found in the United States, Australia and across Europe. In Lincoln, five Street Ghosts can be found around Campus Way at the University of Lincoln and three on Flaxengate, near The Collection. 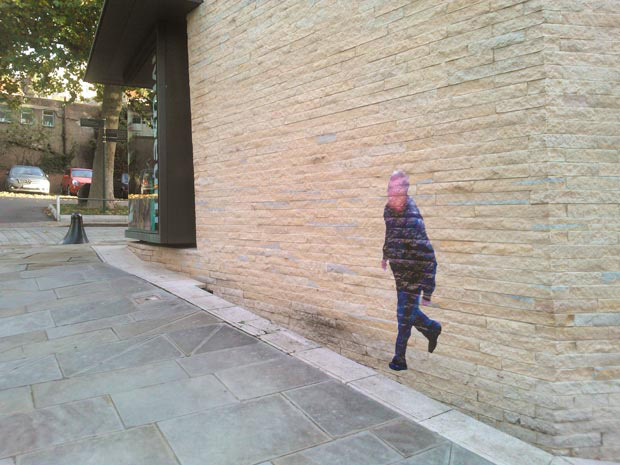 The photos are printed on thin paper and then affixed with wheatpaste at the precise spot on the wall where they appear in the Google Street View image. Google’s Street View service captured images of Lincoln streets initially in 2009, and most of the city is available to explore from a computer screen. Speaking to The Lincolnite, Paolo Cirio said: “It took me one year to come out with a concept, beyond just finding access to a wide-format printer. “I think by working on the blurring pictures of people from the past suggested me the title for the project. “When I published the project, internet companies, like Google, didn’t have any policy about personal data of people who pass away, they just wanted to keep any information they collect forever and trade it without asking permission. “Today these issues are better regulated, however those companies will always try to misappropriate and store public and private information and sell it back to us. “Street Ghosts reveals this abusive business model by reconfiguring the simple visual exposure and the context in which the pictures are displayed. “It did shock people quite a lot and surprising for me too, as I would be more concerned to be on a Google Map forever and visible by anyone in the world rather than on a wall of an unknown street for a short time. “That reaction is due to a shifting cultural perception of our privacy and what is public in the Internet world and what is private in the physical world; it underlines how people should be educated about these new environments before they lose their rights. Paolo Cirio said reactions to his Street Ghosts project was varied, depending on the country and their cultures. “In Germany it generated surely more concern, as culturally Germans are quite sensitive to their privacy.